From the Ford Aspire 2018 images trending on the Internet, it is quite evident that the Ford Aspire 2018 exterior has received prominent styling tweaks. There is a new grille at the front, which can be had with optional silver treatment and chrome surrounds. The headlamps now sport a new design and come with a new cluster as well as mild smoked treatment. 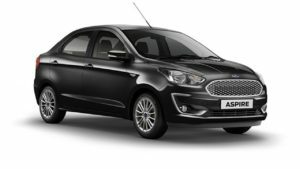 As for the Ford Aspire 2018 colours, it is available in several choices. The overall shape and design remain quite similar to the older model, but the face looks very new now. There are also many things that helps distinguish between the Aspire’s old and new model. For starters, the old Aston Martin-ish grille with chrome slats is now replaced by a subtle, better-looking honeycomb pattern. The re-profiled bumper gets a black housing incorporating the air dam and circular fog lamps with C-shaped chrome surrounding them. Sadly, the car still misses out on DRLs, a pair of which could have added to the appeal. Then, the silhouette is the same albeit with new ORVMs and classy multi-spoke alloy wheels. Besides, a reworked rear bumper, revised tail lamps and a thick chrome slat enhance the look at the back. Get into the car and you are greeted by the familiar two-tone black and beige dashboard. The major change on the inside is the addition of the 6.5-inch touchscreen with the Ford Sync 3 system on the top-of-the-line Titanium+ cars. The unit is seamless in operation, very responsive and offers a level of slickness similar to that of most smartphones. The interface is intuitive and easy to understand, the display goes bright enough for even drives across a desert and what enhances the experience manifold, is the presence of Apple CarPlay and Android Auto. Even connectivity has been enhanced with an improved Bluetooth system and an extra USB slot (Titanium+ only). And if you look closely, the dials have been upgraded too. They now get a carbon fibre-like texture; much nicer than the plain looking earlier dials. With its new rubberised screen control knobs and additional chrome, the cabin has been given a bit of a lift too. The piano black surfaces, carried over from the earlier car, add to the premium feel, there are no badly built bits and most of the plastic bits feel hard-wearing. Quality levels, however, are a step down from those seen in the Dzire, and what the Ford also lacks is that sense of space the Maruti cabin delivers.The Aspire’s cabin is as practical as ever, especially up front. The door pockets are very accommodating and are smartly designed to hold bottles of all sizes; the glovebox is massive and there’s even a nicely executed stowage area between the seats where you can keep all sorts of odds and ends. Overall visibility from the driver’s seat is good. Even tall drivers can find a comfortable driving position quite easily, and the wide front seats provide good under-thigh and shoulder support as well. More importantly, the seats cushioning is just right.Legroom in the rear is good as well due to the Aspire’s long wheelbase (the longest in its class), and the seat, though not as good as some rivals, offers good support and a nicely reclined backrest. Shoulder room is tight though, as is the headroom, especially for passengers taller 6ft. The 1.2-litre Ti-VCT petrol engine from the predecessor is now replaced by an all-new, Dragon petrol motor that debuted on the Freestyle. This three-cylinder, 1.2-litre Dragon petrol mill produces class-leading 95bhp of power and 120Nm of torque. There’s also a new five-speed manual gearbox that is standard even with the diesel engine, which we will talk about in a while. Let’s first get to the petrol. We tapped the engine start button and the powerplant started without much of a noise. The idling is silent and the refinement is good enough for a three-cylinder mill.Start moving, say from standstill and you realise the low-rpm throttle response is ordinary. The surge only starts to come above 2,000rpm otherwise below that, the punch (torque) feels weak. However, as you speed up, you realise it has enough pep to push the car. Above 4,000rpm is where I’d like it to be. Use the gearbox judiciously and the engine performance feels not just acceptable but on par with segment standards. Of course, as you accelerate to higher rpms the three-cylinder thrum becomes audible. The tyre noise also seeps into the cabin when doing three-digits speeds. The diesel, on the other hand, gets the tried-and-tested 99bhp 1.5-litre four-cylinder TDCI motor. The mild clatter is still there but with 215Nm of torque; this one allows the car to putter around the city in third or fourth gear at 30-40kmph, without the engine lugging at all. Overtaking slow moving vehicles doesn’t make you feel nervous and you can take on the highways easily thanks to its good mid-range with torquey nature. The performance also starts getting stronger as the rpm needle climbs, while cruising at triple-digit speeds remains to be a breeze.Then, the highlight is the new five-speed gearbox with short throws and well-defined gates. There’s no notchy feel in the shifts and that makes it a slick transmission to use. This, along with a light clutch with short travel, makes it great for the city. Furthermore, the steering at parking speed is light and weighs up nicely with increase in speeds. It is direct and quick to react making things easier within the city. The compact sedan continues to feel very chuckable and even around tight corners handling feels safe. There’s minimal body roll too. According to the Ford Aspire 2018 review, the subcompact sees a prominent change in performance and handling as it gets the new 1.2-litre Dragon petrol engine.Where the Aspire also leads the class is in the areas of ride and handling. Ford’s beautifully tuned suspension handles bad roads extremely well with very few broken patches of road transferred through to the cabin. What’s more, the suspension is fairly silent while going over bad roads; only sharp and deep potholes are heard and felt inside the cabin. Our only complaint is that there’s a hint of bobbing if the surface of the road is less than perfect. High-speed stability is also good. There is a bit of body roll and steering feel when you get into a corner, it isn’t great, but apart from that, the Aspire feels so on the ball. Even when you up the speed, it is easily the most entertaining car to drive in its class. Tight corners, long bends, poorly surfaced roads, the Ford can take whatever you throw at it. The electric power steering is light enough to make driving in bumper-to-bumper traffic not feel like a chore, and it is well weighted and feels nicely connected to the road in corners. The only fly in the ointment is that the ABS kicks in a little early, especially on bumpy sections. In general, the brakes are so sharp and beautifully set-up, they add considerably to the overall driving experience. With new engines, cosmetic changes and more comfort as well as safety features, the Ford Aspire 2018 offers a better package. Moreover, it sees a price drop over its predecessor. Ford has played their cards well with the Aspire facelift. Its looks are a differentiating point, cabin is well designed and reasonably spacious with some new equipment. However, it still misses out on some basic features like DRLs, projector headlamps and rear AC vents, which have now become a norm in this compact sedan segment. Nonetheless, the Aspire nails the spot with class-leading safety equipment, most powerful engines in segment, excellent driving experience and prices lesser than its outgoing model. It’s also competitively priced between Rs 5.5 lakhs to Rs 8.14 lakhs (ex-showroom) undercutting the Maruti Suzuki Dzire and the Honda Amaze by good margins. An Aspire to aspire for then then?